When people talk about the cost of living, they usually mean housing, food, transportation, utilities. All the mundane things needed to survive in our society. So, for the most part, when people compare living in Tampa to living in San Francisco the criteria they call the cost of living is a bit more expensive in San Francisco. Living is more than just surviving, and I’m getting sick of just surviving. I recently flew out to San Francisco for a set of job interviews. Literally, the trip was going home for me. I spent the better part of a week visiting friends. The job interview was an experience, which I will probably document elsewhere once it has finished playing out. As part of my visits to the San Francisco area I had to make two side trips. One to Fry’s, for which I snuck some clandesdine photos in order to torture Doug. (After spending an entire hour at Fry’s I only purchased a bag of RJ45 connectors. I can’t find them in bags of 100 in Tampa, and Home Despot wants for qty 10 half the price I paid for qty 100.) The second trip was to Beverages and More, to buy Nan some Stroh for her rum cakes. It was at Bevrages and More that I learned a lesson regarding the cost of Living. First, let me step back in time by a month or so. Tampa has its own Science Fiction and Fantasy convention: Necronomicon. This year the guests of honor were Spider & Jeanne Robinson. I rather like Spider Robinson. I’ve read everything that he’s written that is in paperback, and I’ve been anxious enough to buy a few in hardcover. (Now I step back four years…) In a couple of the Callahan books his character Jake praises Bushmill’s single malt aged Irish whisky; not the cheaper blend. At the time I first encountered this praise I was a scotch drinker, but I was open to expanding my horizons. Spider’s character was right, and the 16 year old Bushmill is a delight. I used to by the 16 year old rather frequently while I lived up in the Oakland Hills. (Back to a month or so ago…) So, I decided, silly fanboy as it may be, that I wanted to give Spider Robinson a bottle of 16 year old Bushmill’s at Necronomicon. A week or so before Necro I went to Carrolwood Liquers, a small independant liquer store that has been very good to Haus Boheme. They didn’t have it, but they let me look through their vendor catalog. Their catalogs from their distributors listed the wholesale price for Bushmills 10 year old as $79 and the 16 year old at $139. One part of me was sad that I just couldn’t afford to buy Spider Robinson a proper tribute, another part of me was incredulous because I had bought an unknown quantity of bottles when I lived in Oakand and I had never bothered to look at the price. I wasn’t sure this was the price I had paid, but it fitted my old lifestyle, and I was a little shocked. Snap to present-ish. I’m in Beverages and More, looking for Stroh. I pass through the Scotch/Irish section. (Section, not just a shelf!) There, right in front of me, is a lesson in the economics of Living, and the difference between Living and surviving. 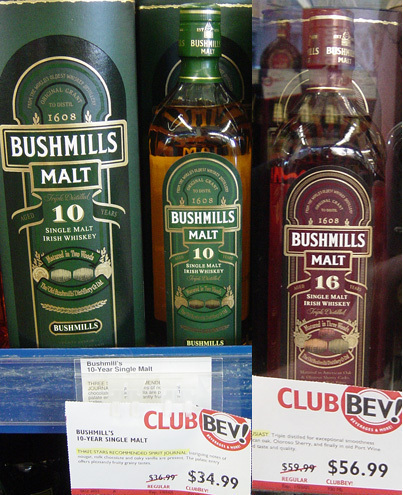 Twelve year old Bushmills for $34.99 and 16 year old for $56.99. The price for the same bottle of whisky was less than half in San Francisco, where the cost of living is more. Had I been in San Francisco I could have easily afforded a proper tribute to an author I respect. I also realized at that time how tired I am of just Surviving. Tampa is less expensive. Tampa is safe. Tampa is easy. I don’t need safe and easy. I need back in the game, and the game just isn’t played in Tampa. How did the interview go, BTW? So true. Boy can I relate to that.